This new CD continues Maria's salute to women blues singers such as Memphis Minnie, Bessie Smith and Lucille Bogan. 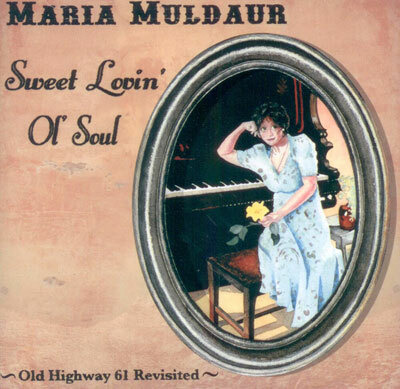 Guests on Sweet Lovin' Ol' Soul (Old Highway 61 Revisited) include Taj Mahal, who duets with Maria on two songs: Ain't What You Used to Have, originally recorded by vaudeville/ blues duo Butterbeans and Suzy; and Take A Stand, a gospel song originally recorded in 1929 by Blind Willie Johnson. Taj also plays guitar and banjo on several tracks. Old friend and fellow blues singer Tracy Nelson joins Maria on the Bessie Smith/Clara Smith duet, I'm Goin' Back; and Alvin Youngblood Hart sings with Maria on the Memphis Minnie/ Kansas Joe song, She Put Me Outdoors. Recent Grammy lifetime achievement award-winning blues pianist Pinetop Perkins performs on Decent Woman Blues, a tune originally recorded by Julia Lee. Other guests on the CD include guitarists Del Rey and Steve James, Chris Isaak bassist Rowland Salley (who also painted the album's cover art), pianist Dave Mathews and jug player Fritz Richmond, who played with Maria in one of her first groups, The Jim Kweskin Jug Band. When with the help of my blues loving, blues playing friends, I made Richland Woman Blues, a tribute to the early blues pioneers whose music so deeply influenced and inspired us all, I had no idea that it would be so enthusiastically received by blues fans and critics alike, says Maria Muldaur in the new CD's liner notes. The positive response received by Richland Woman Blues proved the point I was trying to make that almost 100 years later, this soulful, innovative music is as relevant and moving as when it was first created. The blues as an idiom will continue to be vital and relevant because with grace, wisdom, pathos and a good dose of humor, the blues poetically testify to the common feelings and concerns that have always been a part of the human experience and are not likely to change or go away any time soon.